The piercing cheers of over 500 New York City school kids trumpeted the kickoff event at Symphony Space for the free album, Songs for a Healthier America. Hip Hop Public Health and the Partnership for a Healthier America, chaired by First Lady Michelle Obama, collaborated to produce the project which features health-conscious songs by Ashanti, Jordin Sparks, Ariana Grande, Monifah, Doug E. Fresh and more. Fresh admits that it can be challenging to live a healthy lifestyle but his secret is to begin with a positive outlook on life. 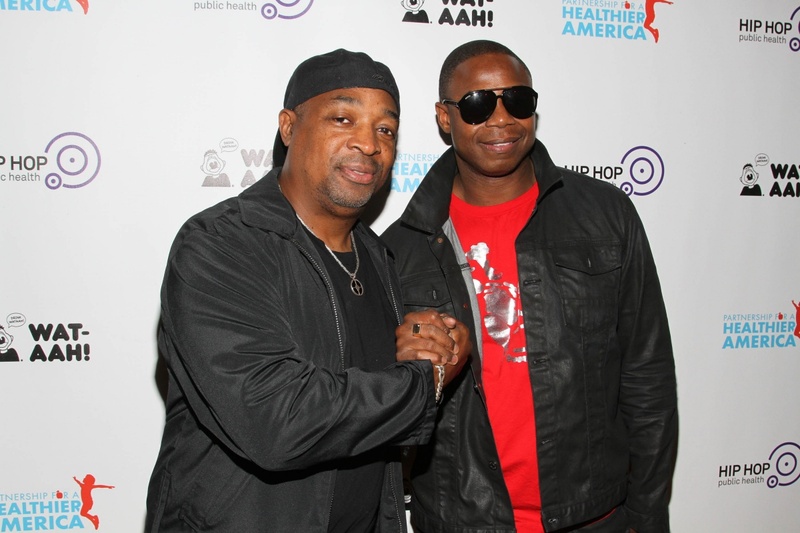 Although he does not appear on the album, Chuck D has consistently used his role as a member of legendary hip-hop group, Public Enemy to deliver important messages. So it only makes sense that he'd support an album that uses hip-hop to fight childhood obesity. "Hip-hop is about words and this project is not just about the nutrition that goes in the body but also positive words," he says. "Words can start peace or start war or help people realize things they might have overlooked. That's when this art form is at its best." Hip-hop recording artist, Rah Digga knows all about the power of music to transform lives which is why she has launched a Kickstarter campaign to raise $20,000 to develop the NJ Dance Network, a community center empowering youth through the performing arts. The New Jersey native plans to have the center located in downtown Newark, one of the nation's hardest hit areas when it comes to violence and poverty. While Mayor and Senate candidate, Cory Booker has received praise for his efforts to improve the image of Newark by attracting new businesses to the area, Digga believes that more needs to be done to directly impact youth. Digga has plans to run for political office, but in the meantime she hopes that her campaign will send a message to constituents that they don't have to wait for politicians to create change. Like Rah Digga, country singer-songwriter, Kandia Crazy Horse is not relying on any system to advance her mission. With her debut single, "California," from the forthcoming album STAMPEDE, Crazy Horse aims to break further ground in country music for Black recording artists. Black roots in country music run deep from Rufus "Tee Tot" Payne being a mentor to Hank Williams to the modern commercial success of Darius Rucker. Still the decision to forge ahead into a genre that lacks diversity takes a certain amount of courage. Crazy Horse has built that strength through her years as a rock critic challenging music's status quo and upending the narrative that rock music is exclusively White in her book, Rip It Up: the Black Experience in Rock & Roll. Being a Black female rock critic in the past has often placed me in the same straits as artists who don't get proper credit when it comes to rock and country. But I am being hopeful and brave that I can overcome regardless and make my place in country's legacy. STAMPEDE definitely displays a personal calling to carry on. I've got to do Georgia proud. The weekly column, On the "A" w/Souleo, covers the intersection of the arts, culture and entertainment scene in Harlem and beyond and is written by Souleo, founder and president of event/media content production company, Souleo Enterprises, LLC.